We as Nintendo Switch owners are privileged in that many of the great indie titles that came out years ago we can finally experience as one enhanced and definitive package. 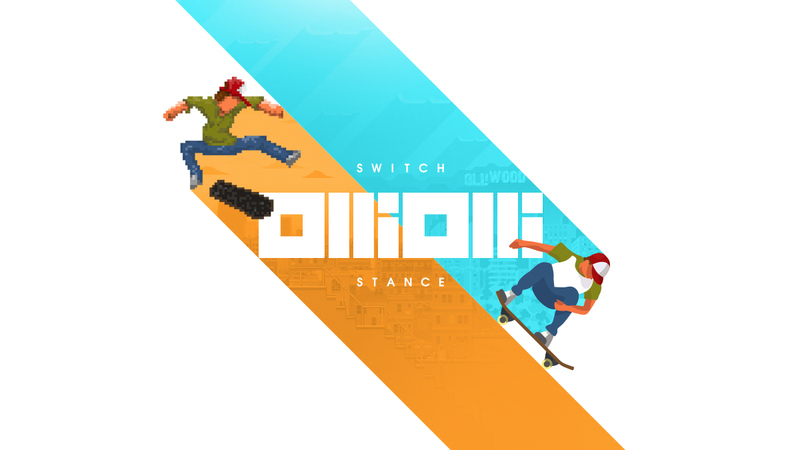 OlliOlli: Switch Stance not only encapsulates what made the OlliOlli and OlliOlli2: Welcome to Olliwood so addictive and fun to play, but showed that skateboarding games can be created in new and unique ways. With both games included in Switch Stance, the amount of quality content you’re getting is staggering in all the best ways imaginable. If you’re a fan of pixel graphics, skateboards, tricks, rails, and crashes, then this collection is perfect for you. Looking at OlliOlli first, this skateboarding platformer is full of awesome music, satisfying tricks, and bone-crunching fails, that will have you replaying levels for hours of entertainment. Not a game you can jump into without any preparation, the tutorials for OlliOlli are a must, at least for me they were. They did a great job of walking you through the basics and will have your tricking and grinding like Tony Hawk in no time, however, the basics will only get you so far. While you have access to a ‘Tricktionary’, where you’ll be able to see in detail how all the tricks are performed. Actually pulling them off though, without cracking your skull is easier said than done. You’ll find yourself failing and replaying levels over and over, but once you get through it will feel all the more satisfying. There are a large number of levels in OlliOlli set in five different stages, each stage has five base levels with five challenges in each. Just finishing a level isn’t enough though, you’ll need to complete the challenges which range from racking up a specific number of combos, scoring enough points in one combo, scoring enough points overall, and more. When you meet all the goals, you’ll unlock the pro version of each level and with more difficult challenges it’s like a whole new level to pull tricks on. The art style is not the most unique, but when done well pixel art makes for an awesome aesthetic. The graphics fit OlliOlli well, complimenting the simple control style and making the game feel like its parts all fit together very nicely. Musically, OlliOlli has some great retro tracks that also go well with the pixel-based art style, although they can get repetitive in how they loop over one another. OlliOlli is the most fun with how well the controls are incorporated into the gameplay as it is fun and easy to pick up. The hardest thing to the gameplay was pressing the right button at the right time to land properly. This is a key element, but once you get the hang of it, you’ll feel an incredible sense of accomplishment. The unique feeling of using the joystick to perform tricks is a mechanic that’s been used before, but not always this well. You’ll gain more points if you time your landings properly, with ratings ranging from “sloppy” to “perfect”. The more tricks you can finish with a perfect rating, the better your final score will be. As the levels progress, you’ll need to pull off some increasingly complicated tricks. You do these by twisting the left analogue stick in specific directions. Whether you’re a fan of skateboarding or not, the platforming element alone is great with a variety of levels and challenges to progress through. OlliOlli alone features plenty of content, but add in OlliOlli2: Welcome to Olliwood and this collection is absolutely jam-packed with content. While you may fail time and time again in pursuit of those challenges, the feeling of finally landing that perfect trick is well worth the wait. On the topic of OlliOlli2: Welcome to Olliwood, it was hard to tell if it was a sequel or successor, but it’s probably most appropriate to just recognize it as a natural progression. It takes a fine-tuned game with a fun concept and progresses it to the next level. OlliOlli2 was everything the original was, but expanded upon it in every way imaginable. The controls are the same as in the original OlliOlli with basic and easy to understand gameplay, but becomes increasingly complex the more you try to master it. A simple flick of the left analog stick can perform even more moves and tricks from the first game. It’s by no means a pick-up-and-play game, but mastery is a necessity to accomplish all that there is to enjoy. When jumping to OlliOlli2, expect a satisfying amount of new features, a fresh new art style that is more modern, additional combos and tricks, alternate paths in the levels, and more varied locations featured from Hollywood. These multi-route levels are a welcome addition to OlliOlli 2. They make each run-through feel more varied and make the original’s gameplay seem one-dimensional in comparison. Also like the first game, difficult is just one of the many words that can be used to describe OlliOlli2. Either from the controls or the challenges laid out in front of you, this game will challenge you every step of the way. Finally, the multiplayer player mode is a blast to play and even though my kids could never really get the hang of it, they still had fun trying to make it through a course. In OlliOlli 2 is there not only a more detailed combo list, but a skate park mode which is basically an extended list of tutorials for a variety of different moves and combos. There are all new ramps and even more areas to allow for monster air combos, and even more ways to express yourself in the tricks you perform. Overall, OlliOlli: Switch Stance is probably the best combination of skate titles to grace the Switch, much less gaming in general. Featuring the complete versions of OlliOlli and OlliOlli2: Welcome to Olliwood, as well even more levels and challenges, this is one collection of games every Switch owner should experience and own.